Which Real Estate Developers in China? Developers told us that local and national banks have been asked to reduce exposure to real estate lending, both construction loans to developers and mortgages to borrowers, to cool market speculation and soaring price appreciation. That has created a waterfall effect whereby the largest developers have reasonable access to low cost bank lending and the smaller, less operationally viable, developers are cut off. Growth to the right relative size and ranking – a moving target – has become a race to survive and prosper. It also becomes, when implemented in a competent way, self-fulfilling. Hence, in a country that has over 4,000 developers looking for ways to grow, it is those that rank among China’s largest that are most able to focus on growing sales and buying land in 2018. Their goal is to climb the ranks and achieve lower funding costs for themselves and their customers. 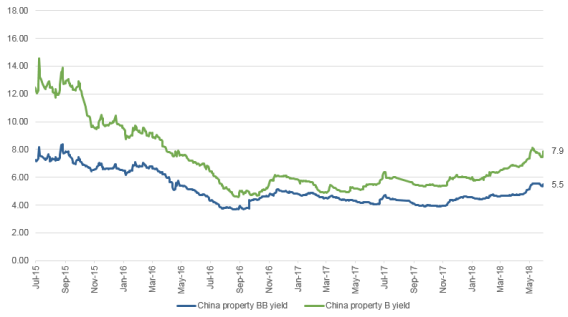 Larger companies often pay a lower premium over and above the People’s Bank of China (PBOC) rate on loans than smaller developers (though debt ratios also play a role). The good news for investors in the larger companies is that big developers have taken advantage of scale and funding costs to gain market share. The estimated market share held by the top 10 developers has doubled from 15% in 2012 to around 30% this year*. This has created an alternative source of land supply whereby bigger developers can cherry pick the best projects from financially strapped smaller developers. These opportunities have been reducing their reliance on highly competitive local government land auctions, but have also helped the smaller developers by reducing the likelihood of a swathe of defaults given many of these smaller developers may have onshore bonds. Most development projects are thriving in Shenzhen, one of 19 tier one1 cities in mainland China just over an hour’s drive from Hong Kong. It has 13 million permanent inhabitants and reportedly the city’s population has been swelled by around 20 million migrants from other parts of China. Most of the major developers issuing bonds have at least one project there or nearby. An increasing number of these companies are keeping the apartments they develop to build a rental portfolio as the government tries to encourage a rental market. Shenzhen has started to compete with Guangzhou, another tier one city and Shenzhen’s politically prominent neighbour, for attention and resources. Tighter restrictions amid the city’s growth are evident: the government has controlled average selling prices (ASP) since mid-2016 after they shot up 40%. First time home buyers now need a 50% cash down payment and the second home requires 75% cash up front. No consumer lending is allowed to fund that cash – banks have become more diligent about checking. Secondary market volumes are slim, as restrictions on owning two properties and the area’s growth ensure many of these new builds are actually lived in. The government hopes a secondary market will develop by 2025. For now, average rental yields are just 2%. Buyers unable to afford Shenzhen have moved to Dongguan, historically a sparse industrial area around an hour’s drive away, in the Greater Bay Area. Dongguan is now targeted for expansion: locals say 120 new companies register in the area each day. These sparks of activity are happening right across the Greater Bay Area as other districts such as Qinghai will benefit from the new Guangzhou rail links, connecting highways being built and favourable tax policies designed to attract skilled workers. The Greater Bay Area’s population of around 80 million could double by 2025, according to one property expert. Developers are excited about the area as a way to buy land at a reasonable cost and sell where prices are appreciating due to migration and government development policies. Importantly, there are no formal pricing controls in these areas to skew the market. Shenzhen and parts of the Greater Bay area are bright spots in China’s real estate market. China’s national sales have hardly grown YTD to April (up 1.3% yoy), reflecting the stark differences between large and small developers and different parts of China. Financing costs have increased for all companies due to tougher regulation and skittish markets. Figure 1 demonstrates how US dollar bond yields have also risen as local investors have reduced the amount of these bonds they buy because RMB bonds yields have risen more, they are less interested in US$ exposure while the RMB remains stable and US$ issuance has increased significantly as developers refinance debt and fund expansion. This has created opportunities for investors interested in US$ bonds. Developers are being forced to pay higher yields in US$ markets to fund their growth and use multiple sources of funding including convertible bonds - or simply reduce their growth targets and deleverage. We do not expect the tightening in real estate to undermine China’s overall growth, at this stage. Hence, investors can benefit by choosing companies that are well placed geographically or able to capitalise on lower funding costs to expand in good areas. We are avoiding smaller developers where their expansion is fuelled by higher funding costs, but we believe average yields approaching 6.5% for established developers with a bond rating above BB with a focus on good locations still look attractive. *Bank of America ML estimate, April 2018. 1 Refers to the Chinese government ranking system first introduced in the 1980s to facilitate a staged rollout of infrastructure and urban development throughout the country. The ranking reflects the government’s development priorities. All information provided is product related, and is not intended to address the circumstances of any particular individual or entity. We are not acting and do not purport to act in any way as an advisor or in a fiduciary capacity. No one should act upon such information without appropriate professional advice after a thorough examination of a particular situation. This is not a recommendation to buy, sell or hold any particular security. Collective investment scheme funds are generally medium to long term investments and the manager, Investec Fund Managers SA (RF) (Pty) Ltd, gives no guarantee with respect to the capital or the return of the fund. Past performance is not necessarily a guide to future performance. The value of participatory interests (units) may go down as well as up. Funds are traded at ruling prices and can engage in borrowing and scrip lending. The fund may borrow up to 10% of its market value to bridge insufficient liquidity. A schedule of charges, fees and advisor fees is available on request from the manager which is registered under the Collective Investment Schemes Control Act. Additional advisor fees may be paid and if so, are subject to the relevant FAIS disclosure requirements. Performance shown is that of the fund and individual investor performance may differ as a result of initial fees, actual investment date, date of any subsequent reinvestment and any dividend withholding tax. There are different fee classes of units on the fund and the information presented is for the most expensive class. Fluctuations or movements in exchange rates may cause the value of underlying international investments to go up or down. Where the fund invests in the units of foreign collective investment schemes, these may levy additional charges which are included in the relevant Total Expense Ratio (TER). A higher TER does not necessarily imply a poor return, nor does a low TER imply a good return. The ratio does not include transaction costs. The current TER cannot be regarded as an indication of the future TERs. Additional information on the funds may be obtained, free of charge, at www.investecassetmanagement.com. The Manager, PO Box 1655, Cape Town, 8000, Tel: 0860 500 100. The scheme trustee is FirstRand Bank Limited, PO Box 7713, Johannesburg, 2000, Tel: (011) 282 1808. Investec Asset Management (Pty) Ltd (“Investec”) is an authorised financial services provider and a member of the Association for Savings and Investment SA (ASISA). A feeder fund is a fund that, apart from assets in liquid form, consists solely of units in a single fund of a collective investment scheme which levies its own charges which could then result in a higher fee structure for the feeder fund. The fund is a sub-fund in the Investec Global Strategy Fund, 49 Avenue J.F. Kennedy, L-1855 Luxembourg, Grand Duchy of Luxembourg, and is approved under the Collective Investment Schemes Control Act. This document is the copyright of Investec and its contents may not be re-used without Investec’s prior permission. Issued by Investec Asset Management, May 2018.